○ 'Gona Re Zou' means place of elephants. ○ This concession is 300 000 hectares that borders on the Gonarezhou National Park of Zimbabwe and on the Kruger National Park of South Africa. ○ This area produces good quality elephant, buffalo, leopard and sable trophy's. Elephant of 70-90 pounds can be found often in this area and buffalo of over 40 inches are regularly taken here. ○ This area is ajoined to the Hwange National Park, the countries largest park. ○ This area is approximately 300 000 hectares. The lodge is less than an hours drive from the Victoria Falls airport. ○ This area is well known for its massive leopard, full maned lion and top quality sable. ○ Other species on quota are elephant, buffalo, eland, waterbuck, kudu, zebra, reedbuck, ‎impala and warthog. ○ Binga is situated on Lake Kariba and is the perfect place to hunt elephant, hippo and crocodile. ○ This is a 4 star lodge and is well suited for the whole family. 4 meter crocodiles are a realistic expectation in this area. ○ This area also offers excellent tiger fishing. ○ Situated in the Western region of Zimbabwe close to the Botswana border and close to the Hwange national park. ○ This area is arguably one of the best for large dark maned lions and also offers good buffalo and sable hunting. ○ Other species available here are; tuskless elephant, giraffe, waterbuck, eland, kudu, zebra, hyena, warthog, impala, side striped jackal, black backed jackal, civet, duiker and baboon. ○ Situated in the south-east of Zimbabwe, close to the Gonarezhou area and north of South Africa's Kruger national park, this area has very good buffalo and hippo hunting. ○ Often one can stumble in lone hippo bulls on land which makes for an exciting hunt. ○ Other species available are; giraffe, eland, zebra, wildebeest, bushbuck, hyena, bushpig, grysbok, impala, duiker and genet. Over and above trophy fees, daily rates and transfer costs. 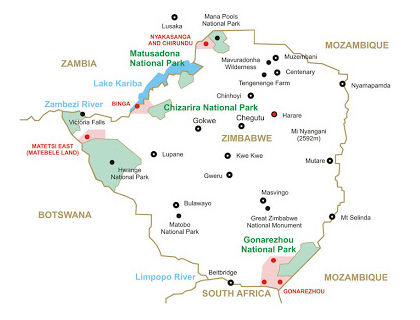 ○ Firearm permits are issued upon arrival at Harare, Victoria Falls or Buffalo Range. ○ We provide you with an invitation letter once the daily rates are paid. ○ No semi-automatic rifles are permitted. ○ Handgun hunts require special permits. ○ Bow hunts require special permits. ○ We do have rifles available to hire. For all hunts, hunting on a 2 on 1 basis deduct $50/day per hunter. Non hunter daily rates $350/day.